Australia’s exports declined while imports were steady in July. 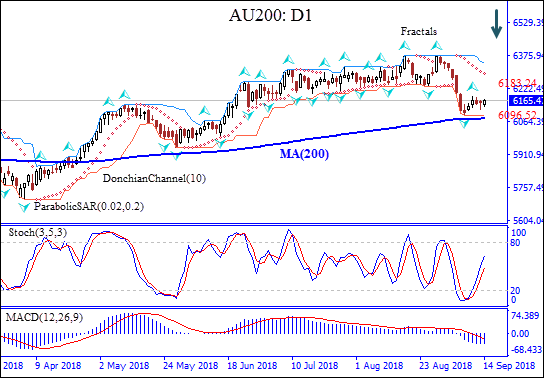 Will the AU200 continue declining? Recent Australian economic data were weak on balance after the Reserve Bank of Australia September 4 meeting. The trade surplus narrowed to A$1.551 billion in July after A$1.937 billion in June due to 1% drop in exports while imports were unchanged. At the same time business confidence declined in August followed by consumer confidence decline in September, though they remained in positive territory. And expansion of activities in construction sector slowed in August. Weaker economic data are bearish for AU200. On the daily timeframe the AU200: D1 is retracing after pullback which followed the climb to 10-year high in mid-August. The price has approached to 200-day moving average MA(200) which has leveled off. We believe the bearish momentum will continue after the price breaches below the lower boundary of Donchian channel at 6096.52. This level can be used as an entry point for placing a pending order to sell. The stop loss can be placed above the last fractal high at 6183.24. After placing the order, the stop loss is to be moved every day to the next fractal high, following Parabolic signals. Thus, we are changing the probable profit/loss ratio to the breakeven point. If the price meets the stop loss level (6183.24) without reaching the order (6096.52), we recommend cancelling the order: the market has undergone internal changes which were not taken into account.